Well, we leave the decision on you, but one thing is guaranteed. Kuelap is worth the attention. The city of Chachapoyas isn't either the best accessible place in Peru nor the most beautiful city we visited along our way around South America. But there are reasons why to visit Chachapoyas for sure. Overall, the northern part of Peru is very often skipped by travelers in favor of other natural and human-made wonders which this country has plenty. But we believe that it will change soon as word of mouth about Kuelap citadel spreads quickly and the remoteness which has kept visitors away for a long time doesn't seem to be such a big obstacle nowadays. Some might argue that to travel (minimum) 10 hours by bus to Chachapoyas region only to see an archeological site can be too much, but luckily, Kuelap is not the only place to visit here. The area is home to one of the highest waterfalls in Peru - Catarata de Gocta, but the enumeration doesn't end here. Chachapoyas region was also a large burial site with mummies, sarcophagus and ruins which are still scattered around. Last but not least, the landscape around the city is beautiful, and every drive from and to Chachapoyas contains views of high green hills, limestone rocks, rapid waters, and deep gorges. Kuelap, more than 3000 meters above sea level, overlooks Utcubamba Valley and the hilly agricultural landscape around. The position, high above its surrounding suggests, that the main reason, to lay the foundation of Kuelap here was military and protection, but this explanation is not correct as Kuelap is not a former fortress, but a citadel. But of course, the position and the wall around the settlement was important in protecting Kuelap against invaders as the times were not always peaceful. The settlement dates back to the 6th century AD. Kuelap was built literally by Chachapoyas people when everyone from the valley and the surrounding settlements climbed the hill every day and gave a helping hand to construct the citadel. Approximately 2500 to 3000 people lived in Kuelap, and only elite of the area could live there. It was home to priests, lords and other significant people for Chachapoyas culture. The majority of structures was built between 900 - 1100 AD and the city thrived until the 16th century when it was abandoned because of the Spanish conquest. 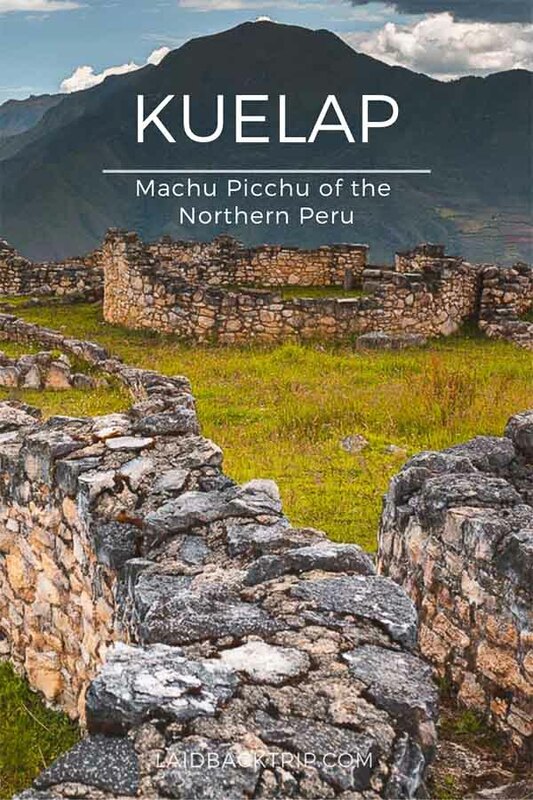 Then the Kuelap was forgotten until the mid-19th century when the local person from Chachapoyas accidentally rediscovered the site and archeologists from all around the world started to pay visits to Kuelap to reveal its secrets. Unfortunately, even nowadays we don't know much about Kuelap as the Chachapoyas culture did not leave any written records, and the site was severely affected by grave robbers. A tall stone wall encircles Kuelap, and there are only three entrances the former inhabitants could use - and it is the same for all visitors until today. The site contains about 550 circular structures - this feature differentiates this archeological site from Inca's ruins throughout Peru who built mostly rectangular buildings (you can find only five rectangular structures in Kuelap). The houses at Kuealp were several meters high to accommodate not only extensive families (around 15 people) but also animals and dead. If you are wondering what does it mean - the Chachapoyas culture strongly believed in post-mortem world and thanks to chewing coca leaves (apparently a lot), they were able to speak with deads which they kept in their houses! That's why Kuelap is also one of the most important burial sites in Peru. Probably the most notable structure at Kuelap is Templo Mayor. Having the shape of an inverted cone, this building doesn't have an entrance, and it has a hole inside. This temple probably served during sacrificial ceremonies, and the priest had to climb the Templo Mayor and drop bones or animals into the hole. You can visit Kuelap either with a tour from Chachapoyas or independently. With a Tour | It is the easiest way how to visit Kuelap. The tour starts early in the morning in Chachapoyas and includes transport, cable car, entrance fee to Kuelap, a guide and lunch. There are many travel agents around the Chachapoyas' square and the all-day tour cost around S/90. Independently | If you want to travel to Kuelap on own, take local public transport from terminal Terrestre to the village Nuevo Tingo. The drive takes about an hour and costs S/7. In Nuevo Tingo, go to the cable car platform, buy a return ticket for S/20 and a private bus will take you to the boarding platform. The cable car ride takes about 20 minutes, and you will disembark at parking lot La Marka. Here buy a ticket to Kuelap for another S/20 and walk uphill to explore the site. To return to Chachapoyas, you must get back to Nuevo Tingo and catch a van back to the city. IS IT BETTER TO VISIT KUELAP WITH TOUR OR INDEPENDENTLY? To be honest, at first, we wanted to go on our own. Right after we arrived by night bus to Chachapoyas in the morning, we accommodated ourselves and went to bus terminal to get to Nuevo Tingo. We even did not make it to the terminal as one van going the same direction picked us up along the way. But when we were about 30 minutes from Chachapoyas, there was a road closure, and the driver told us we must wait three hours until the road opens. Later we found out that there is construction on this road which will take until December 2018 and the road is open only 6 PM to 7 AM and from 1 PM - 2 PM every day. We were quite angry at the driver as he and everyone on the bus must have known about it. But anyway. Everyone made themselves comfortable to wait for three hours, but we knew that we wouldn't make it to Kuelap on time (and also didn't have the patience to do so), but because there was no car going in the opposite direction, we had to walk back 6 kilometers to the main road where we caught a taxi back to Chachapoyas. When we arrived, we went straight away to the information office, where the guy not only told us about the road closure but also said that the cable car doesn't work (they don't know for how long) because of a landslide. We don't believe this was the real reason why the cable car didn't operate, but it is probably a different story. Because we wanted to make sure that we'll get to Kuelap next day, we booked the tour. It cost S/70 (when the cable car works the price is S/90), and we had to get to La Marka by car instead of a cable car which added another 3 hours to this trip. Also, because of the road closure, we had to wait on the way back for a few hours, so the whole tour took beautiful 13 hours. But back to the point. We were only unlucky that the road was closed and the cable car did not work, but as we saw it, even when everything would have been in order, we would opt for the visit of Kuelap with the tour. Not only that traveling on own is not, in this case, cheaper, but we also had a guide who explained about the site (there are not many information boards at Kuelap). Make sure that your guide speaks English though. Kuelap is still mostly visited by local travelers from Peru and English is not widely spoken. Our guide admitted that he started to learn English only eight months ago (he did not understand much our questions but explained everything about Kuelap well), but we found it rather funny that frustrating. At the beginning of 2018, new cable car connection Nuevo Tingo and Kuelap site have been open. The cable car aims to attract more visitors to the area, but it also helped shorten the time spent on the road for about two hours. We did not have a chance to experience it, but to be honest, the drive to Kuelap was so spectacular we did not mind at all. We don't know when the cable car will be reopened again, if this is crucial for you, check with locals, the good news is that you can visit Kuelap although the cable car doesn't work. The best way how to get to Chachapoyas is to take an overnight bus either from Trujillo or Chiclayo. From our experience, we can recommend Movil Bus company. We stayed at reasonably priced new hotel Casa Kuelap Hostal (read review) close to the town center, main plaza and bus station. You can book the room for the best rate via our affiliate link with no additional cost and support our work. To find other accommodation options in Chachapoyas, click here.